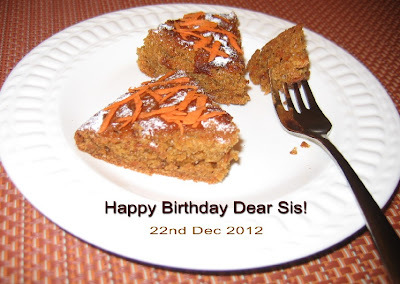 Nithu's Kitchen: It's My Sister Bharati's Birthday! It's My Sister Bharati's Birthday! Dear Akka, We Wish You a Very Happy Birthday. May Shri Mother and Shri Aurobindo Shower their Blessings on You. Have a Winderful Year Ahead. Bharati's Guest Posts - "Fruit Halwa", "Aapam & Thengai Pal", "Coconut Milk Noodles", "Elephant Yam Fry"
Happy Birthday to your sis.